Pumpkin pie in a breakfast form. In a food processor, combine flour, baking powder, baking soda, salt, sugar, ¾ teaspoon pumpkin pie spice and orange zest. Lightly pulse in butter in two stages until pea size. Pulse in pumpkin until incorporated. Lightly pulse in ½ cup milk. Add 1 tablespoon flour at a time if dough is too sticky. Divide dough in half. Pat out dough on a lightly floured surface to a ½-inch thickness. Cut out six 3-inch rounds and six half-inch rectangles for stems of pumpkin. Repeat for other half of dough. Transfer rounds to two parchment-lined baking sheets; place rectangle pieces vertically lengthwise on top of scones and press to adhere. Leave 2 inches between each scone. Bake for 20 minutes. In a medium bowl, combine powdered sugar, ¼ teaspoon pumpkin pie spice and 1 tablespoon milk. Drizzle over scone. 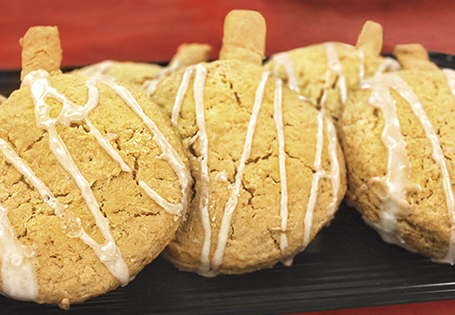 TIP: Decorate scones using colored icing to make Jack-O-Lanterns or other Halloween designs. Omit Pumpkin Pie Glaze if you prefer colored icing.